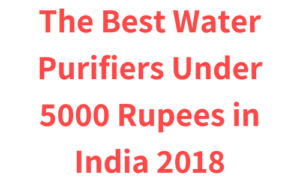 If you are on the budget and looking for best water purifiers under 5000 rupees then I must say you are at the right place. 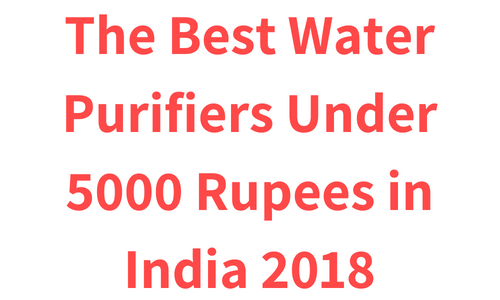 Because in this article I have reviewed the best water purifiers you can buy under 5000 rupees. You will get to know all the specifications and pros and cons of these water purifiers. So without wasting any time lets begin the list. If you are looking for a compact UV water purifier then Eureka Forbes Aquasure aquaflow DX UV water purifier is ideal for you. This water purifier has slim and sleek body and 3-stage water purification technology which is very effective on municipal or tap water low TDS water. This water purifier has very slim and sleek body made from plastic. It has a very simple look with a stand to hold a glass or water bottle which is quite convenient. It also comes with 3 LED indicators, on/off switch and water flow switch which dispenses water when you press it. The first stage of purification is consist of clarity cartridge which removes dust, rust and mud from the water. The second stage of purification is consist of chemi-block which removes foul smell, lead, pesticides, volatile organic chemicals (VOCs) and other organic impurities from the water. The third stage of purification is consists of a UV chamber the water is passed in the UV chamber where it gets exposed to the UV rays of the UV bulb which deactivate harmful bacteria, viruses, Protozoa and other disease causing microorganisms from the water making it safe for drinking. The three stage of purification makes Aquasure aquaflow DX UV water purifier ideal for purification of low TDS water Municipal water. This water purifier also consists of two cartridges. The first cartridge is off pre-filter which removes suspended particles from the water. Second cartridge is of UV chamber. The water is passed through the first cartridge which is the pre-filter, which makes sure that no suspended particles are remain in the water and then it is passed in the second cartridge of UV chamber which deactivate harmful bacteria, viruses and protozoa from the water making it safe for drinking. Additional this water purifier comes with an inbuilt voltage stabilizer which ensures the long life of this water purifier by stabilizing high voltage during voltage fluctuations. This water purifier also comes with an error indicator which notifies you whenever there is any malfunction in the process of purification with its LED light, ensuring that you get pure water every time. This water purifier also offers Hi-outflow rate of 2 litres per minute depending upon the inlet flow of the water. So that you don’t have to wait for too long to fill a glass or water bottle. This water purifier also comes with energy saving mode which basically shuts down the UV bulb when it is not in use for more than 10 minutes, which not only saves some of your electricity expenses but also increases life of the UV bulb. Users like compact design and helpful and practical features of this water purifier. At the same time some users don’t like it’s very basic design. This water purifier is naked from the back side so you can see both cartridge. Some users also experiences low water outflow as the outflow of this water purifier is completely dependent on the inlet water pressure. So if you have low Municipal water flow at your house then the outflow of this water purifier would be slow as well. Fortunately there is a solution for it, you can install a separate pump booster to increase the inlet pressure so that you get fast outflow as well. If you are looking for a compact UV water purifier with and economical price tag then Eureka Forbes Aquasure aquaflow DX UV water purifier is ideal for you. This water purifier comes with a 3-stage purification along with dual cartridge which is very effective on municipal water low TDS water. It also has some other helpful features like voltage stabilizer, error indicator and energy efficient mode. This water purifier has a very basic design and it is naked from backside. Overall this water purifier is a very economical solution for purification of low TDS water Municipal water. If you are looking for a compact, wall mountable water purifier then Kent Smart 7 L non-electric UF water purifier is ideal for you. This water purifier comes with 3-stage purification which is very effective in purifying low TDS water like Municipal water. Kent smart non-electric water purifier is made from Food grade plastic which is non-toxic and durable as well. This is a wall mountable water purifier or you can place it on the kitchen counter as well as per your convenience. It has an ABS construction which does not have any known health effects. Also ABS has a strong resistance to Physical impacts and it is corrosion free as well. This water purifier also comes with a transparent water storage tank which is detachable as well. All the components of this water purifier are push fit i.e. they are attached to each other in such a way that it will not not cause any kind of water leakage. Along with smart looks Kent smart water purifier comes with 3-stage purification. The first stage of purification is consist of sediment filter which has tiny pores of 5 microns and it removes physical impurities like Sand, dirt, mud and dust from the water. The second stage of purification has carbon block filter which removes chlorine and harmful chlorine by-products, bad odour and taste causing contaminants and turbidity as well. The third stage of purification has Spin Welded UF Membrane which is damage proof as well. It has tiny pores of 0.01 Micron which allows water molecules only to pass through it and blocks colloidal material, bacteria, viruses and other organic and inorganic impurities from the water making it safe for drinking. With the 3-stage purification Kent smart 7 L non-electric UF water purifier has a very good solution for the purification of low TDS water like Municipal water. The water storage tank is transparent and detachable as well. It can be easily removed without any help of professionals to clean it. Unlike other UF water purifier Kent Smart 7 litre non-electric water purifier performs all its operations automatically. It does not have water storage tank divided into two compartments like we see in other UF water purifiers and we does not need to manually fill the water to Filter it. We just have to connect the water inlet supply to this water purifier and it will automatically start purification process and will automatically shut down it once the water storage tank gets filled fully. Users like this water purifier for its convenience, sturdy looks and low maintenance. They also found it easier to wash the inner tank, as this water purifier has detachable water storage tank. As this is an automatic water purifier you need to have continuous water flow inlet attached to this water purifier for its continuous working. This water purifier does not comes with any kind of alert system which notifies you about the purification power of its filter. You will have to replace its sediment filter and carbon block filter once in the 12 month or earlier if it gets blocked (Depending upon the the water quality you have). Also you have to replace its UF membrane ones in the two years or earlier if they get blocked (Again depending upon the the water quality you have). Some users also found this water purifier relatively expensive. If you are looking for an automatic, compact, wall mountable water purifier then Kent Smart 7 l non electric UV water purifier is ideal for you. This is a smart looking, compact water purifier with water storage tank of 7 litre which is transparent and detachable as well for easy cleaning. Besides smart looks this water purifier comes with 3-stage water purification system which is very effective in purifying low TDS water like Municipal water. As this is an automatic water purifier, it will require continuous water flow inlet for its continuous working. This water purifier does not comes with any kind of alert system so you have to replace its filter periodically. This water purifier is relatively expensive than other UF water purifier as well. If you are looking for a compact water purifier for purifying low TDS water, Municipal or tap water and you have high water pressure of municipal or tap water then Kent Ultra UV water purifier is ideal for you. This is an UV water purifier and it is very energy efficient as well. Kent Ultra UV water purifier is built with Food grade plastic which is non-toxic and durable as well. This water purifier does not comes with inbuilt water storage tank which makes it very compact and can fit in very small space. Usually UV water purifiers comes with 8 watt UV bulb but Kent Ultra UV water purifier comes with 11 watt UV bulb which is more effective in inactivating harmful bacteria, viruses and protozoa in the water. The first stage of purification is consist of sediment filter which removes visible impurities from the water like Sand, Dust and mud. Municipal or tap water is usually treated with chlorine for the purification which forms chlorine and toxic chlorine by-products in the water. The activated carbon filter absorbs chlorine and toxic Chlorine by-products along with bad taste and odour causing contaminants from the water making it tasty and healthy. The third stage of purification is of UV disinfection. Water is passed through the UV chamber where the water gets exposed to the UV rays of the UV Bulb which inactivates the harmful bacteria, viruses and protozoa from the water making it safe for drinking. The 3-stage purification and UV disinfection makes Kent Ultra UV water purifier ideal for purifying Municipal or tap water. This water purifier also comes with UV fail indicator it notifies you when the UV bulb becomes ineffective ensuring that you get 100% purified water every time. This feature is very helpful as UV Chamber of this water purifier is covered and we cannot see UV rays with our naked eyes as well. Additionally this water purifier also comes with built in SMPS. Basically, SMPS converts high voltage DC current into AC current and it is energy efficient. So it will save some of your electricity expenses. Users are impressed with its energy efficiency and its effectiveness on municipal and tap water. Some users also experiences low water outflow, as the outflow of this water purifier is completely depends on the inflow pressure. So if you have low water pressure of Municipal water at your house then the outflow of the water will be slow. This is a UV water purifier with 3-stage purification so it is ideal for Municipal or tap water. Additionally this water purifier also comes with some useful functions like built in SMPS and alert system. It also has high power UV bulb which is more effective in deactivating harmful bacteria, viruses and protozoa in the water. The outflow of this water purifier is completely depends on the inflow pressure so if you have low water pressure at your house then the outflow of this water purifier would be slow. So this water purifier is not recommended at such condition. Overall Kent Ultra UV water purifier is a good choice for purification of municipal water low TDS water. If you are looking for a good looking gravity based/UF water purifier with advanced purification system then Pureit classic 23 litres gravity based water purifier is ideal for you. This is a good looking water purifier which comes with 4-stage purification system which is very effective for purifying low TDS water like Municipal water. As it is a gravity based water purifier it doesn’t require electricity for working so it is also called as non-electric water purifier. This water purifier has a very elegant, good looking design. And it comes with a water storage tank of 23 litres which is divided into two compartments. The upper compartment is covered whereas the lower compartment is transparent. It also comes with a germkill life indicator which shows you when to replace it. Along with good looks, Pureit classic gravity based water purifier comes with 4-stage purification system. There is a microfiber filter mesh at the first stage of purification which removes visible particles like sand, mud, dirt from the water. The second stage of purification has activated carbon trap which absorbs chlorine and harmful chlorine by-products pesticides and parasites from the water. The third stage of purification is consist of germkill processor which has programmed germ kill Technology which removes harmful bacteria and viruses from the water. The Fourth Stage of purification removes bad odor and taste causing contaminants from the water making it healthy and tasty for drinking. With The 4-Stages of purification and germkill kit, Pureit classic gravity based water purifier has a solid solution for the purification of low TDS water like Municipal water. The upper compartment is of 14 litres where is the lower compartment is of 9 litres. The upper compartment is covered and you have to pour raw water in it. The lower compartment is transparent and the purified water gets stored in the lower compartment. It takes about 1-5 hours to fill the 9 litre purified water storage tank fully depending upon the water quality. Cleaning the activated carbon trap regularly is recommended for the fast purification process. Additional with his water purifier comes with a break resistant tap which is tested over 50,000 times, ensuring that it will last you for a very long time. This water purifier also comes with and alert system which notifies you about the germ kill. It basically notifies when should you change the germ kill kit. Additional it automatically shuts-down the purification process once the germ kill kit gets over. As this water purifier comes with smaller water storage tank the users with small families are satisfied with it. They also appreciated its effectiveness in purification of municipal water (low TDS water). As the upper compartment of this water purifier is of 14 litre and it is covered you don’t get any idea about how much water is remained in it and how much to put in. Also you have to keep track on the lower compartment as if the lower compartment gets fully filled and the upper compartment still has water in it may cause water overflow which is quite inconvenient. Some users also find the body of this water purifier quite delicate so you have to handle it with care. If you are looking for a good looking gravity based water purifier for your small family with effective purification system then Pureit classic 23l gravity based water purifier is ideal for you. Additional in this water purifier comes with alert and auto-shut off feature which will notify you about when to change its germkill kit and it will automatically shuts down its purification operations when the germ kill kit gets over, ensuring that you get purified water every time. This water purifier has small water storage capacity and you may experience slow water purification process, depending upon the quality of water you have which doesn’t makes it ideal for big families. As the upper compartment of this water purifier is bigger than the lower compartment and it is covered as well so you have to keep track on the lower compartment of this water purifier. As if the lower compartment of this water purifier gets filled and there is still water in the upper compartment then it make cause water overflow which is quite inconvenient. If you are looking for a gravity based/UF water purifier with large water storage tank and effective water purification Technology then Tata Swach silver boost 27L Gravity based water purifier is ideal for you. This water purifier comes with multistage water purification Technology which removes bacteria, viruses, cysts, Protozoa and many other contaminants from the water. It also has a large water storage tank. This water purifier has a cylindrical body. It also has a large water purification tank which is divided into two Compartment, the upper compartment is covered and the lower compartment where the purified water gets stored is transparent which gives you enough idea about how much water is remained in the water purifier. Which removes visible impurities from the water like sand, dirt and mud. The second stage of purification is of Tata Swach bulb, which is the heart of the water purifier. It has water purifying capacity of 3000 litres. It has advanced silver nanotechnology which removes harmful contaminants from the water and comes with some advanced features like Tata Swach lock and Tata Swach fuse. Tata Swach lock is basically a sign of originality or genuineness which you have to check every time before installing a new bulb, which helps you ensuring that you get 100% genuine bulb. Tata Swach fuse basically shows you how much purifying capacity is remained in the Tata Swach bulb. Additional it shuts off the water flow once the purifying power of the bulb gets over ensuring that you get pure water every time. It purifies 3-5 litres of water per hour depending upon the quality of water. With its multistage purification Tata Swach silver boost water purifier is a very good gravity based water purifier for the purification of low TDS water like Municipal water. This water purifier comes with a large 27 litre water storage tank which is divided into two compartments the lower compartment and the upper compartment. The upper compartment is of 13 litres and it is covered whereas the lower compartment is of 14 and it is transparent which gives you idea about how much purified water is remained in it. And it takes 3 to 4 hours to feel the purified water storage tank from empty to full. The 3-stage purification of this water purifier gives confidence to the users that they are drinking a safe and pure water. This water purifier is very affordable as well. As the upper compartment of this water purifier is not transparent some users found this inconvenient as you don’t get idea about how much water is remained in it and how much to put in. Some users also experience slow water outflow. This water purifier comes with a pump which removes the air in the filters of this water purifier, so using it frequently is recommended to increase the outflow. This water purifier does not comes with activated carbon filter which we generally see in another gravity based water purifiers. If you are looking for a gravity based water purifier with effective purification system then Tata Swach silver boost 2017 gravity based water purifier is ideal for you. Along with effective multistage purification, this water purifier also comes with a large 27 litre of water storage tank which insurance that you get pure water every time. This water purifier does not comes with activated carbon filter which we generally see in other gravity based water purifiers. Also the upper compartment of this water purifier is covered so you don’t get idea about how much water is remained in it and how much to put in, which is quite inconvenient. You may experience slow water outflow, so using the pump frequently which comes along with this water purifier is recommended to increase the outflow. If you are looking for an affordable gravity based water purifier with large water storage tank and advanced water purification system then Livpure Brahma Neo gravity based water purifier is ideal for you. Most of the gravity based water purifiers are only table top but this water purifier is wall mountable as well. Livpure Brahma Neo is a wall mountable water purifier and you can also use it as a tabletop. It comes with a normal water dispensing tap for dispensing water. You just have to pull deliver to dispense water and it will automatically regain its position once you release the lever. As like most of the gravity based water purifier this water purifier is divided into two compartment (Upper compartment and Lower compartment). It also has I stand with good height which gives convenience while filling glass or water bottle. Livpure Brahma neo gravity based water purifier is equipped with 4 stage water purification. First stage of water purification is consist of particulate filter. At this stage of water purification the physical or visible impurities likes sand, mud, dust etc are removed from the water. This filter is made from food grade plastic and non biodegradable polypropylene fibre. The second stage of water purification is of sediment filter. This filter is made from non woven polypropylene fabric. It removes fine contaminants and suspended impurities from the water. It also works as a protective layer for booster pump head and solenoid valve from malfunctioning by preventing the deposition of sediments. Third stage of water purification has bacteriostatic activated carbon filter. This filter is also known as absorber as it absorbs harmful chemicals and impurities such as herbicides, pesticides, insecticides etc. Municipal water is generally treated with chlorine for the purification which forms harmful chlorine by-products in the water and his filter removes such contaminants from the water. It also removes microorganisms such as bacteria, harmful microbes and viruses from the water. Kitanu Guard comes in at the fourth stage of water purification. The Kitanu Guard has USEPA registered disinfection technology. The main purpose of Kitanu Guard is to provide protection from bacterial, viral and other microbial infections. Kitanu Guard can purify water up to 2000 litres at room temperature. the water purification capacity of the water purifier is really depends upon the quality of the water and also the filter life of the water purifier. This water purifier can purify water upto 12 litres / hr. You will have to change all the filters accept the Kitanu Guard after every 4000 litres of water purification. And you will have to change the Kitanu Guard after every 2000 litres of water purification. With four stage water purification having pretty good water purification filters Livpure Brahma Neo gravity based water purifier has a pretty solid water purification system among gravity based water purifiers. Livpure Brahma Neo comes with a 16 litres of water storage tank. The water storage tank is made from food grade plastic which is non-toxic and durable as well. If you are looking for a gravity based water purifier with good water purification system then Livpure Brahma Neo gravity based water purifier is ideal for you. So these are the best water purifiers under 5000 rupees. I hope you found this list helpful. Let me know if you have any questions in the comments section below.